Miguel turned 6 this week ... i just cant believe it! what on earth happened to my baby? When asked what theme he wanted i knew the answer well before the said it .. LEGO!!! So I got busy and ticked of the long wish list .... I thought that I would share with you what I made as well as the printable PDFs as I know from the many hours of searching on the net that this is a popular theme with very little info. It consisted of 4 pages and a VIP tag. Page 2 was the actual invite with the party details on it. I had left the date blank, because I used a stamp with glow in the dark ink to add the date. The moms told me later that the kids were closing themselves in their closets to see the date magically appear, as they could not wait for night time! Page 3 was the RSVP and map details, and the last was the biggest hit of all ... design your own Lego man! You should see the amazing drawings we got! Assembly is really easy ... each page is 4 up on a A4 [A4 paper is 6 mm narrower and 18 mm longer than the "Letter" paper size], the tag has 8 on a page. Print them and cut out on light grey lines. Take one of each kind, & stack together in the order shown in the photos above and punch a hole in a corner. Then using 2 inches of ball chain and a connector (the kind to attach a plug to a sink or bath and can be bought from any building/plumbing supply store - or use cord) thread through the pages and use the connector to join the two ends together. Finally I used a corner punch to round the corners, but it is not necessary to do so. If you dont see the Green download button just click on a thin grey bar at the bottom of your screen and the menu should appear. The Colouring-in Booklet PDF is 5 pages. To make the cover, I printed page one on yellow cardstock only page one. The inside of the book consists of the 4 remaining pages which I printed double sided (but its not a train smash if u cant). Cut the all pages in half on the lines provided. Then put one of each page together with a cover on top - the order does not matter but just make sure that the maze page is in the middle as it covers 2 booklet pages. Make sure that when you fold you make a nice solid crease. 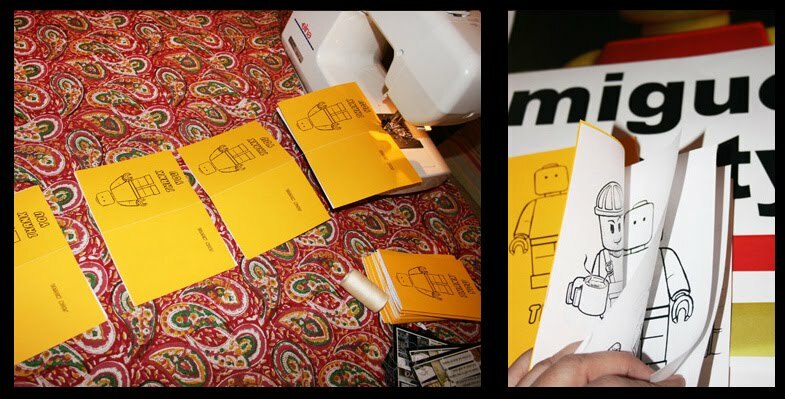 I then used my sewing machine to stitch the pages together. See sewing isn't just for old ladies making doggy coats! You can do all sorts of cool stuff with them!! If you don't have machine you can use a stapler just as well. Now just trim the edges of the booklet so that all the pages finish neatly together. Bunting is a string of flags all sewn together on a fabric line. I made a awesome string of bunting for the party .. with loads of Lego pics and bright blocks of colours inbetween .. but in my old age I forgot to take a photo of said wonderful bunting, so you will have to believe me when I tell you it looked amazing flapping in the sea breeze! I made a really long bunting - about 7 meters, so I printed the pdf out 3 times. The pics are 2 up on a page. Print and cut in half. I also cut out card stock of the same size in yellow, blue and red. The order that I put them in was, one pic and then a card stock - but any order will do. You will also need bias tape if you are sewing or just some cord or string if you are not going to sew the bunting. Scissor Variations - has one showing you how to make paper bunting if you don't have a sewing machine. Katie from Explanation Required a brilliant tute on sewing bunting - except instead of using fabric flags you will use your paper ones. 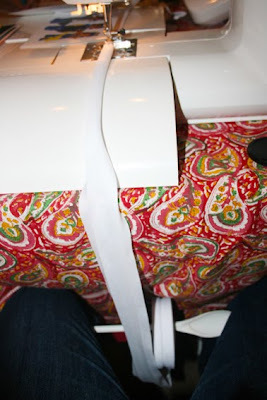 I do have one little tip for sewing loooooong strips of bias though. It can get twisted as you sew, so it can cause quite a bit of teeth gnashing and hair pulling to keep having to un twist it so that it feeds though nice and straight. I buy my bias on rolls that are 25 meters long, all I do is thread the roll onto a stick (or on my case a baking spoon -a very necessary sewing tool) hold between my knees and off i go!! The last but most certainly not the least, the THANK YOU's for the party packs. 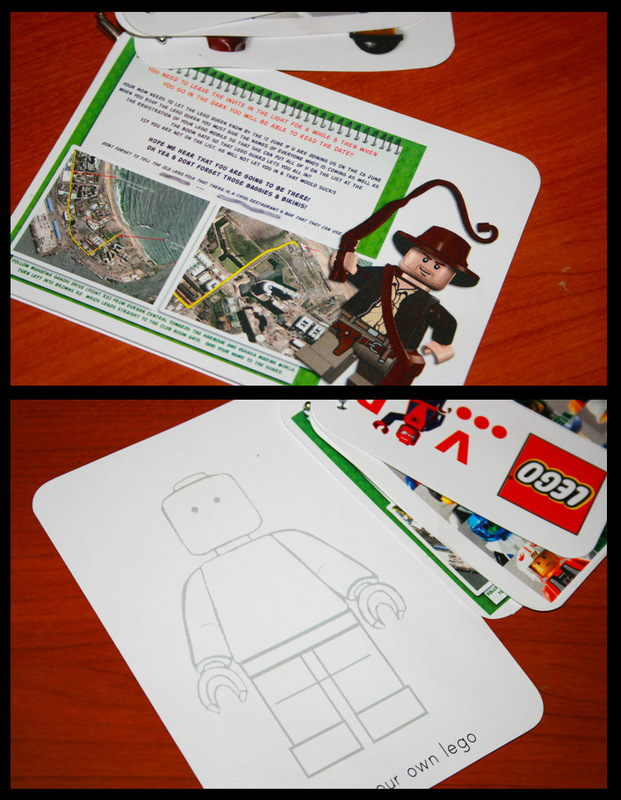 Print onto A4 adhesive sheets. Cut them out on the lines. For the pack I used clear packets for the party bags, which after filling with a few tasty treats I simply folded over and closed using the sticker that I had made!! 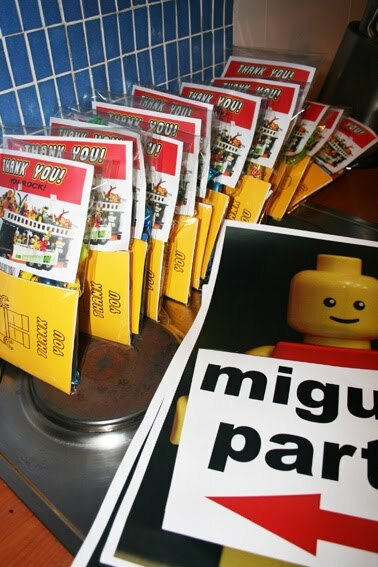 The last thing I made for the party were chocolate Lego blocks ... yes i know I'm a HUGE sucker for punishment! Actually it was really easy to make, i was really surprised and I am sure that I will do it again! I used a food grade silicone (it will come with instructions so you'll be fine!!) I glued some Lego pieces right side up in to a disposable foil baking tray. I then poured the mixture over the lot, making sure that it covers the Lego about 1 inch. I let it set overnight, but check your instructions as different products may require different curing methods. The Lego blocks being plastic just slide right out the set mixture, so there is no need to put any lubricant on them before casting. I then melted milk chocolate on my stove in a glass bowl sent on to a pot of hot water and let it slowly melt (not boiling water as it could burn the choc). When it was melted I used a spoon, scooped some out and poured it into the mould, put it into the fridge and on 40min .... da daaaa yummy Lego blocks !! Well i hop that some of this was useful to some one out there in desperate mommy party land! If you have any questions at all just let me know and I'll do my bst to help out ... Have fun!! Thank you so much for sharing. This is exactly what I was looking for. You are great! Can you tell me the brand of the silicone you used and/or where to find it? Thanks! LOVE the mold. Can you please tell me the brand of silicone that you used and/or where to find it? Thanks! LOVE the mold. Could you please share the brand of silicone that you used and/or where to find it? Thanks! I'm glad you got your comments working! Your post has been very helpful as I plan my son's party in a few weeks. Thanks! We also have such a party on Friday. I like your colouring book very much, but I can´t download it. Would you send the book in an email to me? I would love the coloring book for my sons party, but can't download it without a subscription or downloading my own document (and I don't have any worth it at the moment.) Is there anyway you can email this to me? love these ideas! I had no idea food grade silicon was so easy to use! 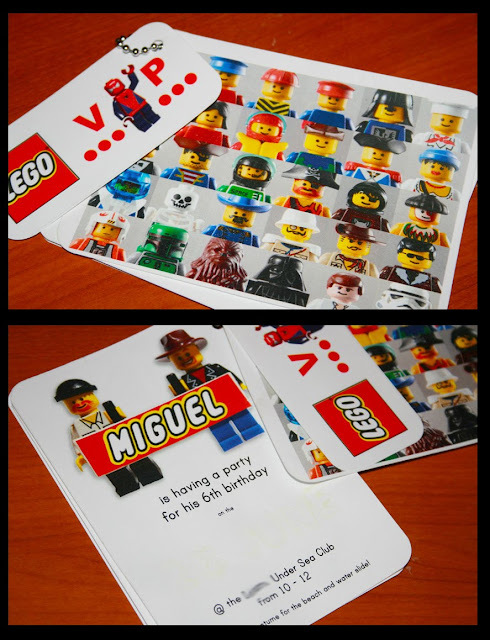 I am planning a lego party for my lil guys 4th! is there any way to get your files for the invite and the coloring book (amazing work there btw!) somewhere other than on scribd?? hubby doesnt want me to pay to download if at all possible since we are tight on cash. totally using all your ideas! I am a stage 3b cancer conqueror! Like I told the Doctor when he told me I had a 20% survival rate,"Ill take those odds, hell if someone offered you a lotto ticket with 20% odds in your favor, you would take the ticket wouldn't you? Bring it on!! I beat the odds, i now can do anything. Then again so can you... --------------------------------------------------------"There are, it has been said, two types of people in the world. There are those who, when presented with a glass that is exactly half full, say: this glass is half full. And then there are those who say: this glass is half empty. The world belongs, however, to those who can look at the glass and say: What's up with this glass? Excuse me? Excuse me? This is my glass? I don't think so. My glass was full! And it was a bigger glass! " - (Terry Pratchett, The Truth)------------------------------------------------ I am a Graphic Designer, mom, fiancee and wannabe Beyonce Impersonator - the fact that I am caucasian, short, middle aged and a little on the chubby side, is of no consequence to me and I don't see it as a barrier at all!! ooh yeah and .. I LOVE to sew too. People who really like me ... yes they really like me! !